In my three day look at the best Lord of the Rings film locations in New Zealand, I’ve saved the best for last, that being the Hobbiton movie set in Matamata on the west side of New Zealand’s north island. The bucolic imagery of life in The Shire probably made more moviegoers long to be Little Folk than anything else in the films. Driving into the set from our home base in Hamilton, Traci, Brooke, Myles and I never tired of the scenery which was literally mile after mile of terraced green hills dotted by flocks of grazing sheep, orchards and occasionally bisected by deep, narrow streams. Since ranching predominates in this part of the island, we probably also saw more fencing than any other place on earth we could think of. The entire landscape is cut into parcels by endless lines of barbed wire, but what might be an eyesore somewhere else just seems rather quaint in New Zealand. If you don’t know the history of Hobbiton, here it is in a nutshell. During the filming of The Fellowship of the Ring, director Peter Jackson leased this land from a local farmer to create The Shire. It was built around a natural depression in the landscape, at the bottom of which was a small lake. The lower elevation meant that the surrounding farms were hidden by the hills during filming, creating the impression of the area being more rural than is actually the case. The verdant hillsides were also excellent for the digging numerous hobbit holes. The original set was temporary of course, and almost everything was removed once the first trilogy wrapped. When it was decided to turn J.R.R. Tolkien’s prequel, The Hobbit, into its own trilogy, the set had to be recreated to look decades newer than the original. Additional hobbit holes were constructed on adjacent hillsides so The Shire would look larger and this time, permanent materials were used so the entire site could be developed into a tourist attraction. Thus, the Hobbiton Movie Set was born. The magic of Hobbiton is found in its detail. Different hobbit holes were created at different scales so the actors using them would look proportional. Each home was designed to reflect its occupants, from the clutter lining their front yards to the colorful glyphs painted on their tiny mail boxes. These details might’ve been lost on moviegoers, but it did make the tour more engaging as you tried to guess the professions of each resident. Racks of realistic fish could be seen drying outside one hole. Another had huge wheels of cheese for sale and another baskets of artificial (but very realistic) baked goods. The place even smelled good — which one of our guides told us was the result of braziers hidden inside the hobbit hole chimneys which are infused with the aroma of cooking meat. At the hub of the village is an expansive and very real community garden, and the movie set employs a small legion of landscapers just to keep all of this fresh and growing. Further down the path you come to the lake which you cross using a stone bridge and eventually arriving at the famous Green Dragon tavern. Meals are offered here for special tours, but everyone can avail themselves to cold cider or ginger beer, a comfortable seat and a warm hearth regardless of which tour they take. Of all the places we visited in New Zealand related to the LOTR movies, Hobbiton was the most immersive. This is by design of course, but it works. Unlike places like Disneyland which also enshroud you in a fantasy world, the realism of Hobbiton is pervasive. 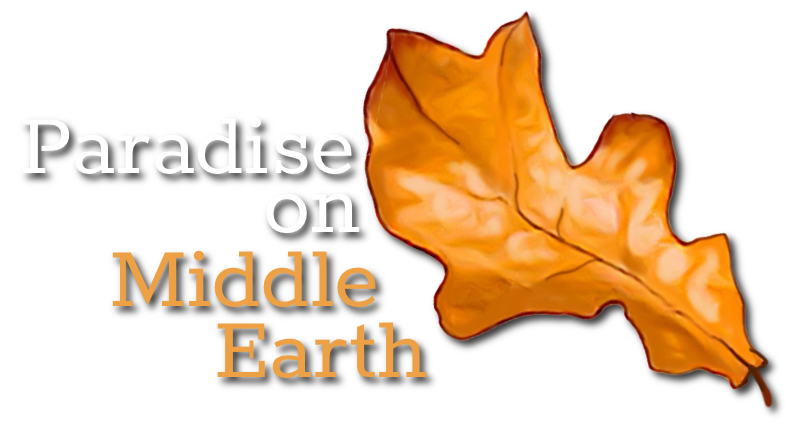 Here you can, if only for a while, feel like you’re in the best place on Middle Earth.